I’m always on the look out for fun and new places to take the children, and often the only way I hear about them are by word of mouth. Having had 6 years of experience now of trial and error, working out where is worth going to, and where isn’t, I now have quite a good repertoire of places that we all enjoy visiting in and around Oxfordshire (mainly). I thought I’d share them with you here when I visit them, and also when I find new ones too. On a rainy day last weekend, we had to cancel our plans to got to a National Trust house and find an alternative. The friends we were meeting suggested going to the Milestones Museum in Basingstoke. Not having heard of it before, I was surprised to discover that it had rave reviews on TripAdvisor and from the website it actually looked quite good. We had £40 of Tesco clubcard days out vouchers to use up, so when I realised they accepted those too, it was a done deal. The museum is about 1 hour drive from Abingdon. It is based inside a large hanger about the size of a football pitch and is fitted out inside with a nostalgic look at what England would have looked like throughout the last century. Real vintage trams, steam trains, cars and fire engines sit outside replica brick-built shops on real cobbled streets. You can climb in most of the vehicles, and dress up in different costumes from the ages in the dressing up tent. There is a sweet shop where you can spend your old one penny sweet ration that you buy on entry, to buy 2oz of sweets from a selection of old sweet jars (what children during sugar rationing would have been allowed for a whole week). There is even a real pub in the middle of it all where you can sit and have a drink. There are displays of everything you can imagine, from old hoovers and hair dryers, to what a living room would have looked like in the 30s through to the 70s. We probably had the most fun in the Old Penny Arcade at the end. You change a £1 into 10 old pennies and use them on the impressive collection of old penny arcade machines. We all really enjoyed the museum, and spent a good three hours there, including some time having lunch in the café. I’d say it would hold interest for all members if the family, from grandparents, teenagers, to little ones. I’m surprised it has taken us this long to hear about it – hence this blog post is trying to spread the word into Oxfordshire! Journey time – One hour drive from Abingdon. For the amount of time you can spend there I’d say it is definitely worth the drive. Parking – Easy parking right outside the museum. Opening Times – It’s open from 11am-4pm on the weekends. We went on a rainy Saturday in September and arrived at midday, I thought it might be packed but I was surprised to find it wasn’t. Entrance – We paid £30 for a family (2 adults and up to 3 children), but bought the entry with our Tesco Clubcard Days Out vouchers, so got in for free! Eating – There’s a nice café there as you go in, that serves hot food and cold sandwiches, cakes, soup, sausage rolls and lunch boxes for children. I highly recommend this place for a rainy day out! As a distraction from endless child rearing, I recently decided to do complete an online film making course with Xanthe Berkeley, on the recommendation of my friend and fellow blogger Katherine Lightner. The course is aimed at anyone who has any type of film making equipment, from a snazzy DSLR camera, to your iPhone, and is made to fit around our busy modern lives. It consists of 10 online tutorials that are posted once a week. You can watch the weekly tutorial all in one go or just pick it up whenever you get a moment (I would squeeze one in while I was doing the washing up, and then another in the 10 minutes in bed before I went to sleep and so on). Then you make films that week based on the topic she sets and post them in a online group at the end of the week. There is no problem if you don’t manage to share any videos, or if you fall behind in the tutorials – its all done at your own pace. You learn everything from different types of shooting (e.g. slow motion, time lapse, stop motion), to using music in your films, to how to edit them together. Watching everyone else’s videos at the end of each week is especially inspiring. Watching Xanthe’s videos was enough to inspire me to try and film more (you can watch some on her website). The whole idea of the course is to try to get you to film more of the everyday moments that make up your life and to capture the things that photography can’t. She teaches you to make films out of everything and anything, and that the length really doesn’t matter – even a 15 second mini movie is something worth making. Since doing the course I have become somewhat addicted to making these little movies. And as much as I love making them, the children love helping me – they are much more willing participants than when I ask them to pose for a photo! It has also served as a big eye opener for me to see how beautiful and idyllic some parts of my life can seem when played back in slow motion with some nice music over the top! From now on I am planning on spending everyday with head phones on playing Einaudi, to drown out the racket around me and hopefully get me to see my life in a more positive way! I highly recommend doing one of Xanthe’s courses if you have any interest in film making. It really has opened my eyes to a whole new world of photographic art that I don’t do enough of and that I actually really love. The memories I’ve captured through these films are irreplaceable and add another dimension to my bank of memories that are more than just taking photos. I am going to try my best to keep making these for as long as a can! I’m always on the look out for fun and new places to take the children, and often the only way I hear about them are by word of mouth. Having had 6 years of experience now of trial and error, working out where is worth going to, and where isn’t, I now have quite a good repertoire of places that we all enjoy visiting in and around Oxfordshire (mainly), so I thought I’d share them with you here when I visit them, and also when I find new ones too. Last week, on the first day of the holidays, while the weather was warm and my Mum was staying with us, I took the children to have a paddle and a picnic at the ruins of Minster Lovell hall. We had been here a few years ago for a picnic with friends, and, although we hadn’t gone in the river that time as the boys were both pretty little, my husband seemed pretty sure that the river was shallow enough to paddle in. With the weather having been so warm, I had considered taking them to our local outdoor swimming pool, but as there were 5 of them (ranging in ages from 7 months to 6 years old) vs. two of us, one look from Mum was enough to convince me it was probably a bad idea. So we packed our buckets and fishing nets, threw a picnic together and headed off. Minster Lovell is a small, picturesque village in the Cotswolds, north west of Witney. It has a few lovely thatched cottages, a small pub and hotel, and behind the grounds of the church stand the ruins of an old house, built in the 1500s, set in grounds next to a beautifully peaceful flowing river. We all had a go at paddling in the river, which was about knee height at its deepest at the point; where we got in, a helpful tree trunk dips from the bank into the river, which makes a lovely place to climb in and out. There are also deeper parts to the river, in case you feel brave enough to go for a proper dip. After a paddle, as the boys had come armed with swords and guns, they spent much of the time running around the ruins playing ninja warriors on the hunt for dragons. It was a lovely backdrop for imaginary play. Even if the weather isn’t good enough to go paddling and you’re little ones aren’t up for playing ninja warriors, it is a really idyllic place for a picnic. Bring a ball, or a Frisbee, and just enjoy the peaceful setting. Journey time – From Abingdon it was 35 min drive. I was slightly worried that we’d get there and everyone would be bored within 20 minutes , but luckily they weren’t, so driving that far was worth it I’d say. We ended up staying there a good hour and a half. Parking – There is a small parking area at the top of the lane that leads down to the church, but once that’s full I think you have to park on the side of the road that goes down into the village. Get there early for guaranteed parking. Opening times – “Any reasonable hour” is printed on the board as you arrive! We arrived at 10.30 and it was pretty quiet when we got there. As we were leaving at 12ish (on a warm sunny day in the summer holidays), quite a few large groups of people were starting to arrive and it just didn’t feel quite so peaceful anymore, so I’d recommend getting there early if it is peak season. Eating – There is a pub further down in the village, but I have never been so can’t recommend it. Bring a picnic! Toilets – There are no toilets here or anywhere nearby that I could see, so its a case of peeing in the bushes for the children and just going before you leave for anyone else! Things to bring – Buckets and fishing nets; its pretty pebbly in the river so Crocs/flipflops are a good idea (wellies only OK if they stick to the shallower ends); swimming costumes for the brave and a change of clothes just in case. If you have enjoyed this post and are looking for more ideas on where to take the children in and around Oxfordshire, have a look at my other great day out at the Living Rainforest. The last few months have been true test of my motherly strength. 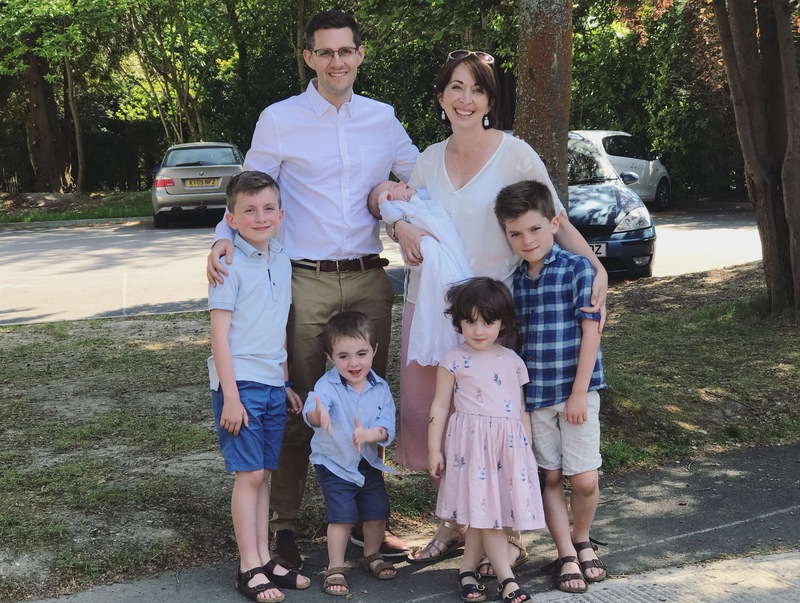 I knew that having 4 children would be tough going at times, but nothing really prepared me for the never-ending and gruelling challenge that I have faced some days, just to make it through from morning to bedtime, without crumpling to the floor in a sobbing, gibbering mess . I had so many people tell me that they’d heard that once you have had 3 then 4 is not much different – I’m sorry, I disagree. Really, how easy you find managing 3 or more children, all comes down to personalities and age combinations. If you have 3 already in school full time and then you add another baby, then that is very different to 2 in school, a toddler at home all day and then a baby. Which is where I am right now. Anything vaguely extracurricular to child rearing has been pushed aside and my main focus every day is just keeping everyone fed, watered and slept with as minimal crying as possible (from myself and the children). It’s just about survival. I’ve found that surviving with any number of children comes down to constantly maintaining that very fine balance in which they must all be happily entertained, well slept, well fed, and all in good health at all times. When you have four, the chances of this balance being upset are much obviously higher and it the sh*t hitting the fan happens much more frequently. It’s the ultimate game of spinning plates. Three of the children could be balanced out pretty well, but then one gets a cold, or decides not to nap and then everything collapses. Looking after that one child slightly more than usual has a domino effect on the rest of them. You suddenly don’t have enough time to get the others the attention they crave and so on, and the day comes crashing down around you. There are moments of course when everything goes really well and I get to the end of the day feeling pretty pleased with myself: everyone has found an activity they can all play together; they have all enjoyed the meals I cooked; everyone has napped when they were supposed to and it has all worked like clockwork. On these days I rejoice in my large family that gets on so harmoniously and my superhuman abilities. However, the following day the baby might fight every sleep; the toddler is left downstairs pacing around and screaming on her own while you pace with the baby (intermittently throwing the door open just as you put the baby down to sleep); the boys refuse to play together and everyone hates their dinner. On these days I have felt like this is IT. This is my life forever more. But I know deep down that these hard times when the little ones are really hard work, are just a jot in our lives and they’ll be forgotten as quickly as they started. I’ve done it before with my two eldest and I can get through it all again. It WILL all be worth it. Just for now I will have keep focussing on the good days and try to forget the bad, and keep on spinning those plates! Since the summer has arrived we have been spending the last few weeks trying to get our garden under control, as the bulbs and weeds that have been left to multiply over the last year, since we moved, have just gone crazy in the warm wet weather. So on father’s day at the weekend we decided to go out and buy a fruit tree to plant at the bottom of the garden. I’ve been deliberating about what fruit to buy for a while now, and we finally settled on a pear tree – good for cooking, good for eating, and a bit more interesting than apples. It was like it was sent from God Himself – a “Williams’ Bon Chretien” (Williams’ Good Christian)! A Williams’ pear tree for the Williams’. That was enough of a sign for us, so we took it home and planted it outside with the children that afternoon. The pressure of having yet another living thing to keep alive does make me slightly nervous, but if I manage it, it will be lovely to watch this tree grow with the family, and enjoy the fruit it gives us each year. We’ll always remember planting it on father’s day in my fourth baby’s first year. Happy father’s day Lance! Here’s to many pear crumbles over the years to come. I’m always on the look out for fun and new places to take the children, and often the only way I hear about them are by word of mouth. Having had 6 years of experience now of trial and error, working out where is worth going to and where isn’t, I now have quite a good repertoire of places that we all enjoy visiting in and around Oxfordshire (mainly), so I thought I’d share them with you here when I visit them, and also when I find new ones too. The Living Rainforest is in a small village about a 10 minute drive from the A34, just outside Newbury. It consists of two large greenhouses that house different tropical plants, and a small selection of wildlife (think the Eden Project but about a quarter of the size), a nice little gift shop, an educational area for children (where they often have activities and demonstrations going on), a café and an adventure playground. The wildlife isn’t extensive but enough to get small children excited. Amongst other things they have: insects, frogs, tortoises, terrapins, sting rays, tropical birds, fish, butterflies, armadillos, small monkeys, lizards and more. How long could you spend there? A couple of hours in a morning or afternoon maximum – this isn’t a ‘whole day out’ place. And I’d say you’d only make it that long there if it’s a nice enough day that the children can go and run around in the playground for half an hour. So it’s worth dropping into on a rainy day if you are local, but if you are driving from the Oxford area you’d probably want it to be nice weather in order to make the most of it and worth the drive. How much does it cost and is it value for money? Adult entry is £10 and children aged 5+ are £8.50. This seems a lot when you are only there for a couple of hours, but then the ticket is also an annual pass so that does make it quite good value. I’d say for children it will appeal to younger years more; my 2, 5 and nearly 7 year old really enjoy themselves and are happy to keep going back but much older than this and I’m sure one trip will probably be enough! Café or bring a picnic? There is a café that serves a basic lunch menu, ice cream and cake, though it is in need of a bit of refurbishment. I tend to take a pack lunch and eat it outside in the playground – there are lots of picnic tables provided there. Wear cool but waterproof clothes and shoes (though not essential, depending on your child’s “attraction to large puddles-ometer”) – the greenhouses are hot and humid, so the floors can get very wet and toddlers no so stable on their feet may end up with wet muddy bottoms. Get there early in the holidays – A friend mentioned that she’d got there in the afternoon in the Easter holidays with excited children and had to come home as the small car park there was full! I think the name probably builds it up to be much grander than it actually is , so some people may come away feeling slightly disappointed. Don’t go there with great expectations and you’ll be pleasantly surprised. We have been going to the living rainforest for a couple of years now and my boys still really enjoy it. It’s something a little bit different, educational and easy to trundle around with a group of children of different ages (see my short video above!). I do have my hands full. Although my eldest two (5 and 6) are both in school now, this also means I now need to get all 5 of us fed (and breastfed! ), dressed, and out of the house by 8.30 every morning to walk to and from school and then back out again in the afternoon. The time in between these school runs is spent entertaining my nearly two year old while breastfeeding the new-born. When the children are all at home with me in the early mornings and afternoons, I spend most of these feeds with the boys on either side of me watching TV (Netflix and Cbeebies have been my saviour over the last few months, I’m afraid to say), and my little girl sitting on my lap trying to kiss the baby while demanding I read her another book. She has reached the stage now where she wants to be by my side at all times; I’m lucky if I can sneak off upstairs for more than two minutes during the day, to put away some washing, before she turns around and discovers I’ve gone, my heart sinking as I hear the cries of “Muuuuuummyyyyy! Where aarrrrre you? !” from the living room, as I rush to pair as many socks as I can, before she finds me. I’ll admit I was kind of dreading the new baby’s arrival – the thought of adding an unpredictable new-born into my life again (which I manage pretty well, but only by having quite a set routine) terrified me. During the weeks after he was born and while Lance was still home, I’d be pacing up and down a dark room trying to calm a screaming baby while he made the dinner for the children, wondering how earth I would manage a situation like this on my own, when he goes back to work. I have now survived nearly 3 months of this new way of life and my response when friends have anxiously asked me “So how are you? !” has been “Surprisingly ok actually!”. I’d say the best way to describe how I feel at the moment is ‘content’. On reading the above paragraphs I can imagine that “content” is probably the last thing most people would feel being faced with what I am doing day in and day out. And don’t get me wrong – I have certainly had a good few moments of desperation when the house has been a tip, the baby is screaming and won’t go to sleep, the toddler has just been sick all over her cot and all I have been able to muster to make for dinner is plain spaghetti with a fish finger (probably one of my less “content” moments to be honest). It has taken me a while to work out how I can possibly be feeling like this. It struck me a week or so ago when I read this brilliant blog post by Jennifer Fulwiller. In it she describes her slow realisation that actually it is only really through living for others, embracing the hard times as something to offer to God, and throwing ourselves into our “vocation” (if we have found it) that we find true happiness. Being open to what God throws at us; accepting and welcoming every joy, but also every trial, with open arms is the only way to deal with life. This is something that secular society today (where any pain, suffering, and sacrifice must be avoided, if possible, at all costs) finds hard to understand – life is based around endlessly scrabbling for more money, more holidays, more clothes, new relationships with new partners, but no one is ever truly satisfied. Forever waiting for the next stage in life – “when I’ve finally got that promotion…”, “when my children have left home…”, “when I’ve got the new kitchen…” – everything will be better. As Jennifer so beautifully paraphrases: “what you think is out there, ain’t there!”. As Christians we are taught and continually reminded to embrace trials, suffering, and pain – to use the lessons we learn from them to be grateful for the goodness we have in our lives, iron out our flaws, and to strive to become better people for the good of others. Having children is possibly the most perfect way to live out these ideals – as parents we live our lives almost entirely for our children and have to embrace any hardships, or inconveniences that come with it. Being a mother is my vocation. Yes, I miss working on some days, but would I give up meeting my children at the school gates every day, so that I can go back to work? Heck no. I honestly think that the aspects of my faith, which I mention above, have helped me enormously in accepting my life as it is now and to just get on and embrace it. I’ve made a conscious decision to try to stop waiting for the next stage of their development, when they’ve grown up, and when things will be better and easier. Instead I am living for the now. This is it. Family is what life is all about. Take the hardships and offer them up to God; use them to develop myself. I’m surrounded with work that doesn’t give me bonuses, holidays, and a bigger house; but that is real hard graft – often mind bogglingly monotonous, soul sapping and exhausting, and gives me something that nothing else can – maternal love for the four most beautiful, irreplaceable children. A recent study found that parents with four or more children are the happiest – and I am starting to see why: the more children you have, yes, the more you have to give, but also the more you receive. It’s as if every child gives you a 100% pay rise. “Gosh, you’re so blessed!” she replied. I was so taken aback by her reply that I stumbled a ‘Umm, yes…thank you!’ and carried on walking. It took a while for what she had said to sink in and I now wish I had run back and given her a hug. It was like God had shone his light down on me right there, in the midst of my turmoil, and reminded how lucky I am. Her reply has stayed with me ever since and I don’t think I will ever forget it, where ever my life goes from here. Yes. Yes, I am blessed.